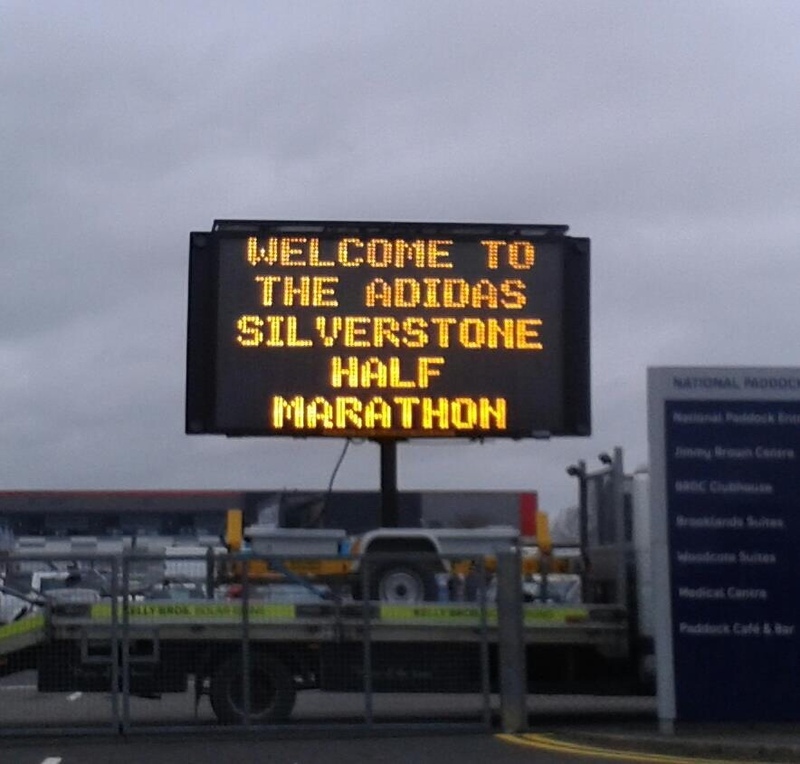 Sunday I headed down to Silverstone, home of British motor racing and of my first half marathon, to tackle the 13.1mile course for the second year. In 2013 I travelled down on the train, stayed in a hotel in Northampton the nights before and after, and made the most of a sort-of weekend break on my own. 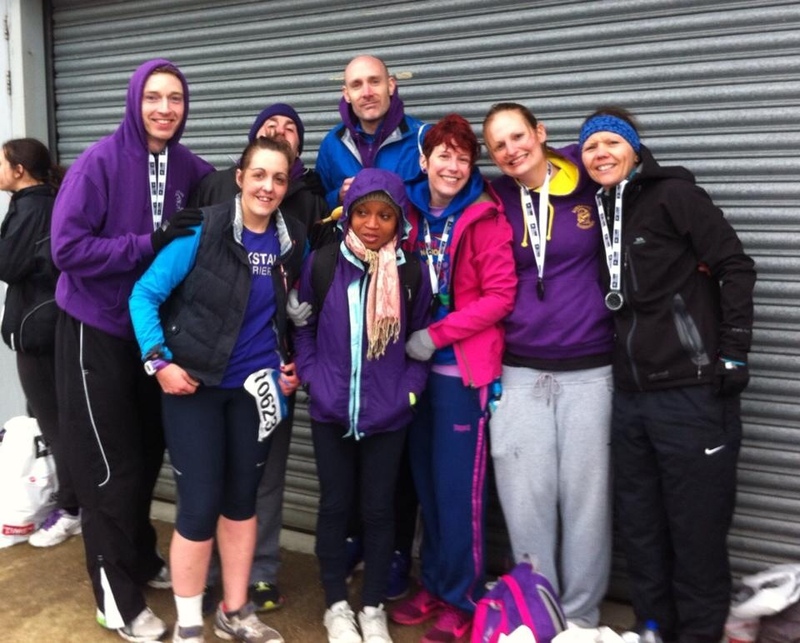 This year I cajoled some of my fellow Kirkstall Harriers to join me, so there were two cars driving down, each with four keen runners. My lovely friend Alix did her usual nice thing and lent me the car for the day, so I drove my very good friends Sam, Bethan and Vikki. With a CD selection that included Disney, a poptastic compilation and Eddie Stobart Trucking Songs, we headed off bright and early. Getting to within a few miles of Silverstone is very straightforward, but the last five miles along the A43 and into the car park took us an hour. Not good. But still, we arrived with just the right amount of time to pee, get changed, insert contact lenses and drop off our bags. The weather was looking a bit iffy. We’d had a few spots of rain on the way down, and the skies were decidedly grey in places, but the main problem was going to be the wind. Anyway, we had dispersed by now and headed to the grid in our own fashions. I met James on the way to the start area he had driven down with Shami, Kieran and Scott – and we had a natter and jumped around as they played The Chain for the start. I set off just behind the 1:58 pacer, thinking I could go for a crazy goal and smash my first sub-2 half. It was all fine for the first few miles – it didn’t feel horribly tough although it was quite busy. But after about four miles the pacer was suddenly gone, so I just pushed on. Up to about halfway I was feeling fantastic. I love Silverstone and it just feels so cool to be running on the track. But as I got to the 7-mile marker I just wasn’t feeling on it anymore. My watch read 7.25miles, and it stayed a quarter of a mile up to the end, but at least I knew not to rely on it for distance between the markers (which are every mile anyway with a big digital clock showing gun time). Anyway, I had another gel at mile 8 but as I kept getting buffeted by the wind I was losing speed and enthusiasm. I tried to draw some energy from other runners, and had another gel at mile 10 simply to make sure I wasn’t going to flag from lack of energy. Nothing hurt, I didn’t have tummy cramps, my legs weren’t screaming horribly or my head telling me I couldn’t do it – it just felt so tough because of the wind. At least with the twists and turns we got the occasional bit of respite, and for the most part it was coming head-on, so I could stay upright and going forward rather than wobbling around side to side. I think it was also colder than I realised. Bethan came up on me about mile 11 so we said hi and then off she went. I battled on and seeing the mile 12 marker was the best feeling ever. 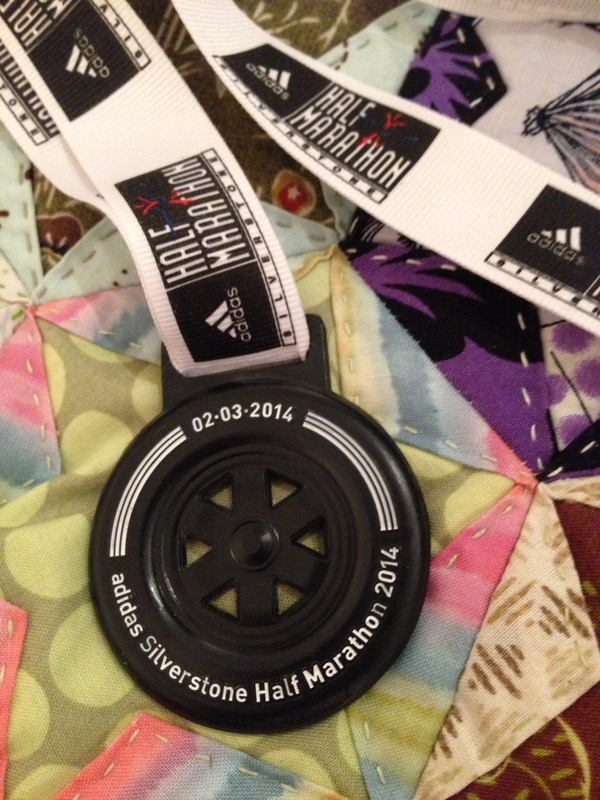 I thought about finishing strong and talked myself round the final corners. I also considered the amazing will of the people all around me, all just so determined to get to that line. The only saving grace was the last dash to the finish line where we had a tail wind. BEST THING EVER. 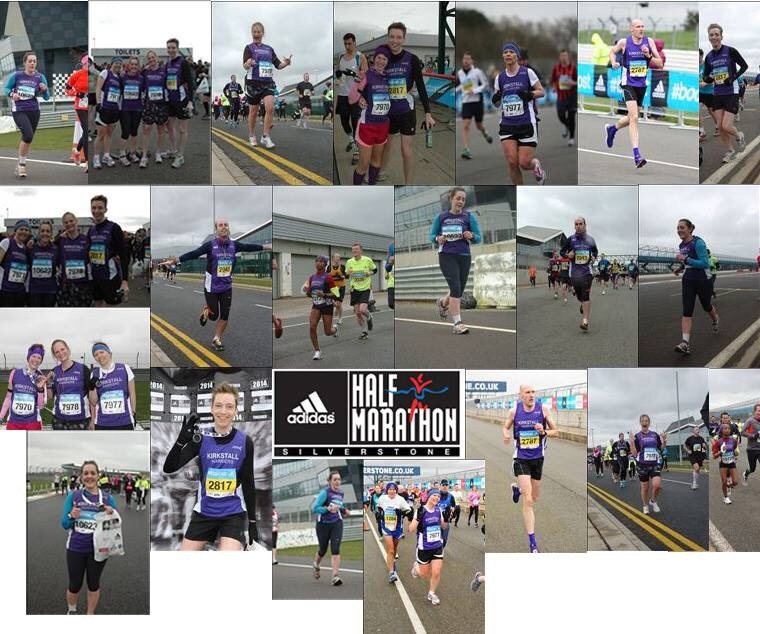 I put in a massive sprint finish (no idea where from) and hobbled over the line in 2:09:05. That’s a PB by 3m 7s and an improvement over the same race last year of 12m 54s. At first I felt a little deflated that I didn’t smash my PB by more, but given the tough conditions and the fact that I haven’t trained specifically for this race I know I did bloody well. It was hard work, but I enjoyed it. Best of all, we got an absolutely brilliant medal – it’s a tyre! This makes me super happy. 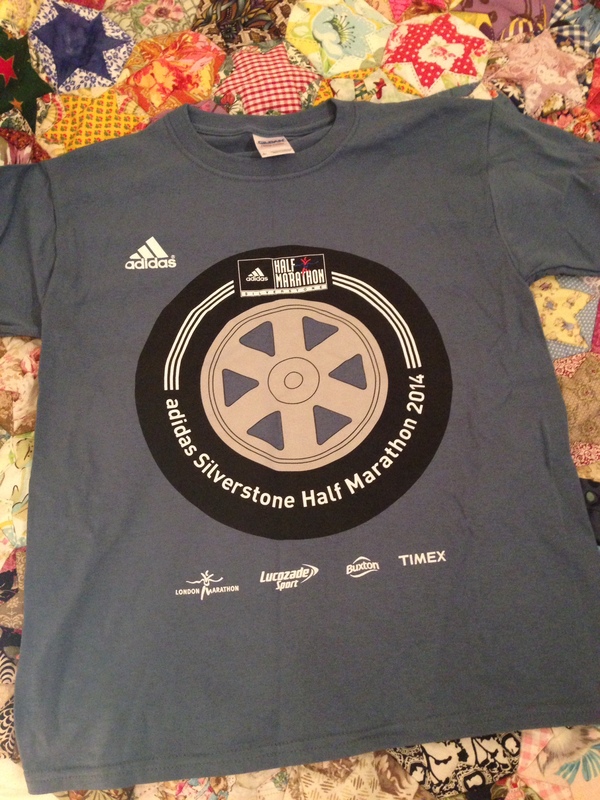 The t-shirt is also cool, and the goody bag contained nice things like peppermint tea and arnica gel! Aside from the car parking fiasco, which happens at every event at Silverstone it seems, and the mess-up with changing my address for my race pack to be posted (they said they had updated the system, but they hadn’t) this is a well organised race on the day. There are stands for coffees and burgers etc at the start, many toilets, easy to understand bag drop system, a few shops and charity stands. And once again I was pleasantly surprised by the number of spectators at some points around the course. Not many of them shout for runners other than their partners/parents/children etc, but it’s still nice to see and hear them. For me, this is definitely a must-do race each year. The potential for a PB is massive and, even with the travelling either side of the race, I didn’t find it too knackering as a day out. And anyway, it’s Silverstone. GO, GO, GO!! !